Animal Manners can help your family at any age or stage. The Dogs & Storks™ and Dog & Baby Connection™programs are the leading national programs for expecting families and families with infants and toddlers. Animal Manners private training offers dog and child friendly training methods taught in a way that is inclusive of all family members. The programs provide valuable planning, training, safety and educational tools to help reduce stress, increase polite behavior and promote a happy, healthy, dog-friendly household. Dogs & Storks is an international program that helps expecting families with dogs get ready for life with baby. The program offers positive, practical, and fun solutions to challenges that often arise when a family with a dog, or dogs, adds a new baby to the household. Learn basic dog body language, how to handle the homecoming, critical safety tips and much more. Dogs & Storks fills in the gaps left uncovered by obedience training and childbirth education classes. Whether this is your first child or fifth, make sure to get off on the right foot, decrease stress and increase harmony in your home by preparing with Dogs & Storks. 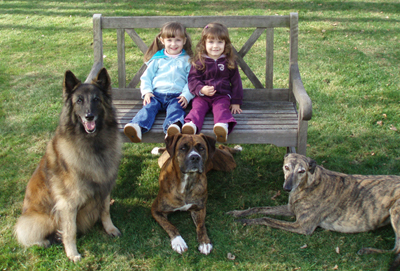 The Dogs & Toddlers Connection is a nationwide program that helps families with dogs and toddler-age children create safety and harmony in the home. The program provides tools to help families with young children and dogs as they face the various stages of baby’s first three years. You’ll learn how to watch for subtle signals from your dog, the need for supervision, realistic management methods, handling the impulsive re-homing phase, facilitating appropriate interaction and much more. Developed by a mother, taught by a mother and geared towards real parents – all the material covered are designed to be relevant and easy to implement.